Enjoy international cuisine at Woodlands, a restaurant which features a bar, or stay in and take advantage of the room service (during limited hours). Breakfast is available daily for a fee. Stay in one of 25 guestrooms featuring flat-screen televisions. Digital television is provided for your entertainment. Private bathrooms with shower/tub combinations feature complimentary toiletries and hair dryers. Conveniences include electric kettles and irons/ironing boards, and housekeeping is provided daily. 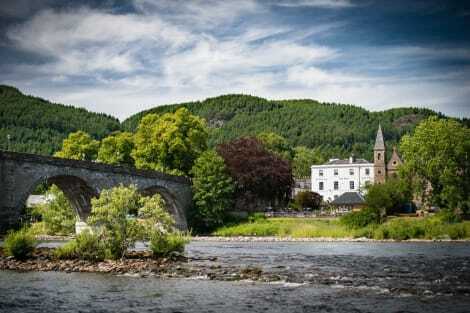 Dunkeld, a delightful cathedral town, is well within reach of the dramatic mountains of the Scottish Highlands and is known for its towering trees. This is the settlement where the King of Scotland emerged victorious against a group of Jacobite clans after the Battle of Dunkeld, which took place in 1689, when Dunkeld was vulnerable to attacks due to the fact that it had no town wall. A captivating architectural masterpiece, Dunkeld Cathedral was completed by the turn of the 16th century, and is now home to a fascinating museum and Archive Room showcasing the building's memorabilia. The cathedral, which features a unique blend of Norman and Gothic architectural styles, replaced a much older former monastery that may have existed as early as the 6th century. On the outskirts of the town is the scenic Craigvinean Forest, which is probably best known for The Hermitage. This National Trust-owned landmark is the site of the formidable Ossian's Hall of Mirrors, which dates back to the Georgian period and was probably the home of the distinguished narrator Ossian. The most spectacular and least spoilt wilderness in Britain, the Scottish Highlands includes the country's highest peak, Ben Nevis, which is 1,344m in elevation. The region is also home to the breathtaking former volcanic valley of Glen Coe and the scenic 23-mile long Loch Ness freshwater lake, famed for its legendary Loch Ness Monster. For accommodation in a beautiful rural location with fine lake views, choose the deluxe Hilton Dunkeld House. 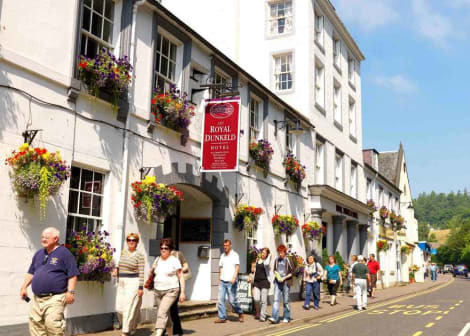 Other popular Dunkeld hotels include the stylish, affordable and pet-friendly Atholl Arms Hotel, the charming Smithy Cottage Bed & Breakfast, and the sophisticated Royal Dunkeld Hotel. For some deliciously fresh fish and chips, head to the Dunkeld Fish Bar, or enjoy some hearty pub classics at Woodlands or the Riverview Restaurant. If you're after some mouthwatering Scottish dishes, you can choose Howie's Bistro near the VisitScotland Dunkeld Information Centre.